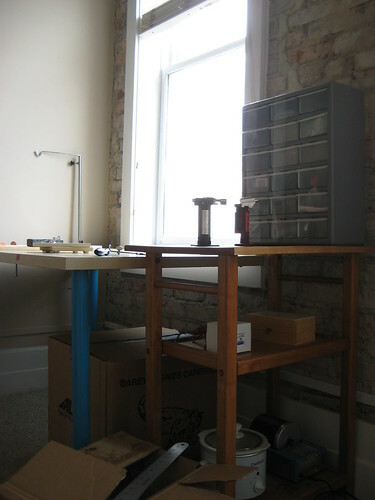 Some semblance of a studio, originally uploaded by antigenre. Well, after a full day of packing, another day of travelling, and yet another of receiving all our worldy possessions from the lovely folks at Carey Moving & Storage, Levi, a very spooked Frist and I have officially landed in Spartanburg, South Carolina. The apartment is just as cool as I remember it from our jaunt down here in May. The whole building seems a bit like the Dolphin Hotel from Haruki Murakami’s A Wild Sheep Chase, which is OK by me. The town is noticably more vibrant now than it was then, as well. There’s a neato gallery just down the road from us that I’m going to hit up in the near future to see if they will carry my jewelry, and the bar across the street from us has just re-opened. The band playing there tonight was the Piedmont Boys, and I was told that they do, along with some originals, mostly 80’s covers. I forgot that that would probably mean country/western/blues from the 80’s, and not, say, Tears for Fears. New inspirations and new ideas abound.